This was our first official toy delivery during our stint as a Fisher Price Family. The look on my daughter’s face when she saw her new My First Dollhouse…. ….was all, “Gah! They’re talking about me. To the treadmill! 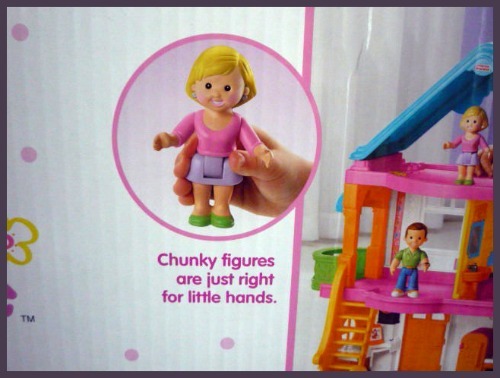 !” *For the record, my husband’s hands are an average size. 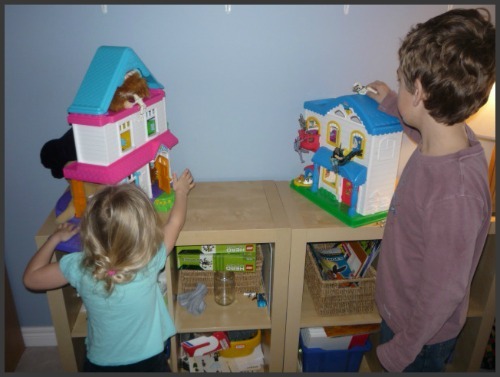 Santa brought Avery a Fisher Price dollhouse two years ago. But this new abode is a more pimped out version. So now, instead of one lonely home, we have the makings of a neighbourhood. It’s a G-rated version of Knot’s Landing (at least, that’s what is going on in MY head when I’m playing along). Avery has a corner of her room dedicated to her imaginary town. 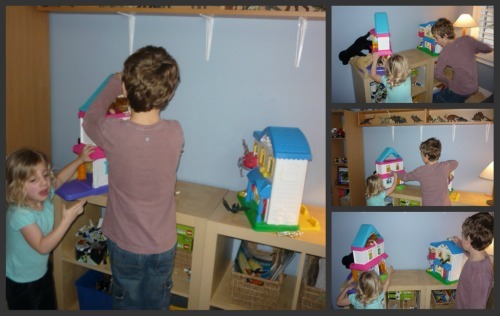 Recently however, I noticed both dollhouses were missing. It seems the kids picked up stakes and moved the town to big brother’s room. In addition to the chunky figures (mom, dad and baby), Avery added a few stuffed animals to the family. In keeping with the ‘more the merrier’ motif, my son moved an army of action of figures into one of the houses. Things got ugly when some of the fluffier residents began to feel their personal space was being invaded. Before long, the poor stuffed animal house was under full attack. Big mistake, because this hostile behaviour was the cause of big brother’s ultimate eviction. If I could add sound to this post, you’d hear Avery say, “Dare. unattended in the dollhouse bathtub). I love stepping back and observing my kids at play. 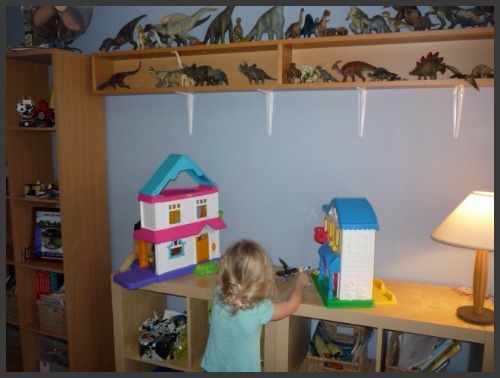 More often than not, they use their favourite toys in unexpected ways, letting their imaginations take them in all kinds of new (and hilarious) directions.